There’s seemingly not much that’s fun in Shinagawa which is where the film takes place. This port area of Tokyo is chock full of warehouses and small businesses and there’s the immigration centre. Further inland are the tower blocks and the impressive JR station. Dotted around are a plethora of residential areas. These are boxed in by inlets from the bay, bridges and roads leading deeper into the city all of which are constantly thrumming with traffic throughout the day. Apart from the motor vehicles, life is pretty quiet. Perhaps this is what is driving 18-year-old Kako (Fumi Nikaido) to distraction during a long hot and humid summer. She has two more semesters before she graduates from high school as she edges closer to adulthood but the pace is slow and the temperature hot. She spends her days sprawled out at home or trudging along the riversides, caring for her young niece Kana (Mochika Yamada). Her soundtrack is the endless buzz of cicadas and traffic and chatter from her family who regularly gather at the family’s cosy restaurant to shell peas from their pods and shoot the breeze. Apart from a couple of urban legends about Yasunori, a boy from a rich family who got abducted, and the mystery the harpoon wielding Mrs Honda who lost her baby to a crocodile roaming the inlets from Tokyo Bay, nothing ever happens. According to Kako, who is investigating these legends, even the most outrageous tales have a normal explanation and the world will always be boring because people live within the limits of imagination. Her perception changes with the surprise arrival of her aunt Mikiko (Kyoko Koizumi). She was thought to have died 18 years ago in an explosion but she’s now standing in the restaurant dressed a little like Female Prisoner #701: Scorpion. After shock from Kako’s family comes relief that Mikiko is back in their lives. Four generations of the same family gather around the prodigal daughter and shower her with tears, smiles, and disbelief, that last emotion coming from Kako and Kana who cannot remember Mikiko, but with Mikiko’s return comes a whole lot of history – she used to be an anti-government terrorist who bombed yakuza. She’s still something of a firecracker as rumours of new terrorist plots emerge but for Kako, who doesn’t really care about all that, the problem is she will have to share her bedroom with this stranger back from the dead! Of course, fireworks ensue between the sullen teen and an aunt fond of explosives. Kako has the sort of attitude, one removed from nihilism, typical of alienated teenagers not pushed outside of their comfort zone or inspired to do anything. In complete contrast to her cuteness in Bitter Honey which was made in the same year, Nikaido displays a deep-seated unease about her existence in every sullen frown, a curiosity and fieriness that appears when challenged by a potential mystery, and a tiredness when she encounters what she considers an inevitable disappointment. Fumi Nikaido does brilliantly in the role and plays off Kyoko Koizumi effectively as the more experienced actress essays a sophisticated and mysterious woman who wants to escape reality. She has a playful side and brings it out of her younger relative with the promise of excitement and bomb-making but there are deeper connections. As Mikiko takes Kako and Kana under her wing, they go on misadventures that change their perceptions on everything. Shiro Maeda proves to be a fantastic writer as he unpacks a lot of family history and emotional ties while establishing Kako’s world. As we see the girl walking around her hometown and see it brought to vivid life, we witness various members of her family get into conversations with a variety of people at a variety of places and unearth decades of tangled relationships from radical student politics to Taichi (Itsuji Itao), Kako’s father, and his love for Mikiko. This is explored by the script as Kako comes to a new understanding of her parents as she spies on Taichi reminiscing over Mikiko and sees the internal family dynamics change amongst the females which proves more gripping as Kako’s mother Satoe (Kumi Hyodo), so used to playing second fiddle to her older sister Mikiko, displays equal amounts pride over having a family and running the restaurant and anxiety over seeing Taichi’s eye wander. Just as affecting is the reaction of the matriarch of the family, Sachi (Masayo Umezawa), suggesting her daughter Mikiko’s freedom-fighting behaviour is selfish rather than heroic or romantic. Indeed, when the drama ramps up, it is the women who navigate things and Taichi is hilariously banished to another room making this a female-driven film. The film’s location is Kitashinagawa and it’s a lovely location in its own way, something Maeda and Yasuyuki Sasaki the film’s cinematographer capture. The mundanity of the place is either stultifying or charming in its familiarity and routines depending upon the person. 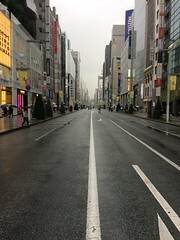 You can understand why Kako feels bored since it’s the type of place which seems unexceptional unlike, say, Shinjuku where there are many areas that draw events and artists. We see Kako’s environment in sequences full of good-looking long and mid-shots which show people going about their daily lives and there are also glorious tracking shots following Kako as she slouches through the streets and over bridges, passing by yakitori places, grocery stores, clothing stores, ladies carrying parasols, salarymen with sweat-soaked shirts. These views are exquisite in getting a closer look at an unsung part of the city as well as capturing the body-language of characters in their surroundings. The camera framing is just as effective as the dialogue in giving us people in their family space of the restaurant and allows us to get involved with them at a respectful distance. The women gather at the same table to perform similar actions showing their connections through physicality and Mikiko and Kako fit in the routine despite their rebelliousness. Maeda only goes for close-ups of Kako and a couple of other characters when they have emotional breakthroughs or for comedic purposes. It’s sort of like Poetry Angel (2017) which saved its major close-up for a smile and it’s the same here as Kako learns to smile because, contrary to what she believed at the start, life in her part of town is full of surprises and she doesn’t need to escape somewhere else to experience excitement. Discovering her family’s past turned out to be fun, a feeling the audience will share.